If you're like most daughters, throughout your lifetime, you have spent far less time with your father than with your mother - especially time alone with one another. You and your father don't know one another nearly as well or talk about personal things like you and your mother do. In fact, your mother always has been the "communications' satellite" relaying important message back and forth between you and your father. It's no surprise, then, that at this stage of your lives you and he probably don't feel as comfortable, communicate as personally, or relate as honestly as you and your mother do - or once did. So what can you do to create a more comfortable, more meaningful, more joyful relationship with your father at this point? When I ask daughters why they don't know their fathers as well as they know their mothers or why they don't share as much personal information with their fathers most say: "Because he's a man, he doesn't want to talk about serious or personal things with me." "Because fathers and daughters aren't supposed to know each other or be open the way mothers and daughters are." Although these beliefs are popular, as a psychologist I say: Nonsense! Stop discriminating against your father. Stop making these negative assumptions about him just because he is a man. Become an "equal opportunity" daughter. 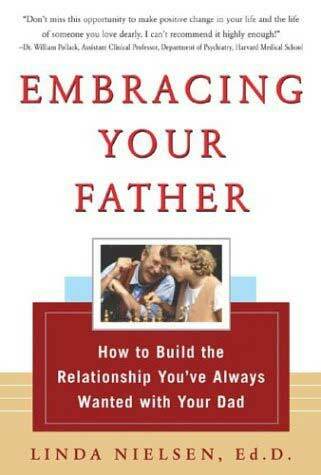 Use my checklist to give your father equal opportunities to create a more meaningful relationship with you. Use 0 for "never," 1 for "rarely," 2 for "usually" and 3 for "almost always." ___ I spend time alone with my father without having other people with us. ___ I talk directly to my dad instead of going through other people to communicate with him. ___ I ask my father for advice and for comfort about personal things. ___ I ask my father meaningful, personal questions about his life. ___ I share important parts of my life with my father. ___ Even at his age, I make an effort to get to know my father. ___ I encourage my father to ask me questions about my life and I respond enthusiastically. ___I let my father know that I appreciate what he has done for me as a parent. ___I let my father know that he has had and still does have an impact on my life. ___I have asked my father what we could do together to feel closer to one another. The single most important thing you can do to strengthen your relationship is to spend more time alone with your father and to use this time alone to ask him more meaningful questions. Go to a religious service alone with you. Go to a movie together-share a box of popcorn. Go back to the neighborhood where he grew up and walk (or drive) around together while he talks to you. Take some pictures of the two of you there together. Sit down with old photograph albums and ask him to talk to you about his favorite pictures. "Tell me more about that. What else was going on in your life at that time? How do you feel about that now?" Remember: nobody else should be around while you're doing this with him. There's a fable about a little girl who asks, "How can Tarzan have been so smart, so strong, and so magnificent that without help from anyone at all he defeated every one of the jungle animals, including the mighty lions." The listener replied, "Child, you'll get a different story if the lion learns to talk." Who was your favorite relative and why? What did you get too little of and too much of from your father? Other than relatives, who had the greatest influence on you as a child and as a teenager? What is the best and the worst advice a friend ever gave you? How have your spiritual beliefs changed over time and why? If you could have any two spiritual questions answered, what would they be? What are three of the best and three of the worst decisions you've ever made? What are some lessons you had to learn the hard way? What are some of the most important things you've learned about love? What was the best gift and best compliment I ever gave you? Another way to ease into meaningful conversations with your father is to watch movies together about family relationships and about aging. These movies are especially good conversation starters for fathers and daughters: Spring Forward, Voyage around my father, Ulee's Gold, Death of a Salesman, Field of Dreams, Hoosiers, About Schmidt, On Golden Pond, Father of the Bride, Nobody's Fool, Pushing Hands. Sue : "I had never seen pictures of him as a child-so small and vulnerable. When I got him talking about his dad, I saw him trying not to cry. I reached over to him and said it was okay to talk to me about it. It was the first time I had ever comforted my father." Lynne: "As I listened to him, I began to see my father as a person who has struggled through life as a man and a husband-not just as my parent. It means so much to have him open up to me." Trish: "Even at my age, I could never imagine talking to my father about personal things. But now I'm relating to him as someone other than an extension of my mother." Amy: "I'm glad I realized before it's too late that my father isn't just a bald guy who always has his head stuck in a book. I am not too old to still learn from him." Anna: "I cried when my father said the best gift I have ever given him is deciding that - finally - I want to get to know him - before it's too late. Regardless of how old you and your father are, by your assuming the initiative to embrace your relationship more fully, you embrace the best in your self. Dr. Nielsen is a nationally recognized expert on father-daughter relationships whose work has been cited in the Christian Science Monitor as well as in a PBS documentary on fathers and daughters being released nationwide in June, 2005. A psychologist and professor at Wake Forest University, she has been teaching the only college course in the country devoted exclusively to father-daughter relationships since 1990. Sharing her work through radio, newspaper, magazine and television interviews, she helps daughters strengthen or reestablish their relationships with their fathers - especially daughters with divorced parents. Visit her web site for more information about father-daughter relationships.